Molle holsters have a specific tactical look to them that is both practical and stylish. Molle is the most popular material used today with the military. It’s durable, and reliable. What, then, is the best molle holster? The CONDOR MA69: VT HOLSTER is the top of the line for me. 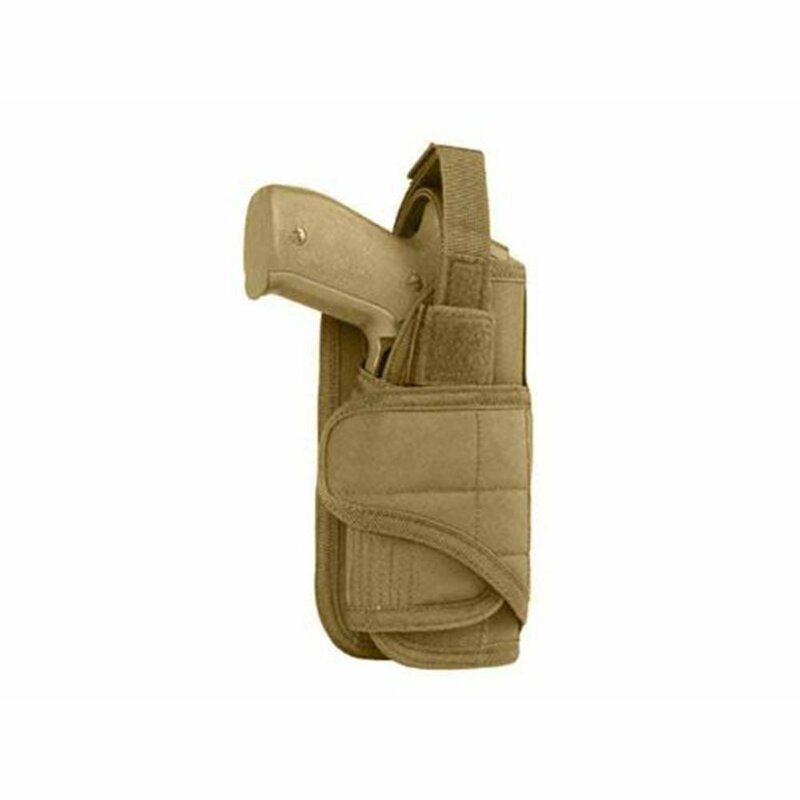 It’s a pretty versatile holster that fits a variety of pistols due to the adjustable velcro flaps. When it comes to holsters, this one is as reliable as any good IWB and well worth it, and it’s highly affordable. According to USA Carry, “One of the most common sources of negligent or accidental discharges is something entering the trigger guard.” While some would argue that there isn’t accidental discharge, there is the mistake of negligence due to faulty accessories or user error. While it might sound like a myth, you can find some horrific stories about people whose holsters caused a round to fire and the results weren’t always pretty. What exactly would cause these accidents, then? Because the design of the holster is the most important part, having any faults in the way it is made can lead to many issues, not just negligent discharge. If there is a mistake, malfunction, or it just doesn’t seem to fit right, you’re better off getting a different holster. Avoiding the wrong holster will not only protect you from such accidents, but it will also protect your firearm from damage, as well as yourself. Whether you consider yourself an old pro or not, making any modifications to a holster can be risky business. You are now changing everything about it, even if it is a small piece. The shape, features, and reliability can be altered, and thus you need to be sure they are safe alterations. Always stay within the manufacturer’s recommended allowance for modifying a holster, for your own safety and the safety of others. If you are inexperienced, please be sure to turn to someone trusted and experienced before trying anything on your own. If you buy a holster for your unadorned firearm and it fits great, don’t think it will always be so if you add any aftermarket parts. Adding to or taking away changes things, and a lot of holster are made specifically. Know exactly what you intend to add or change with your firearm before choosing a holster. The results of a holster that is even slightly off can be an accidental discharge. What do these changes affect? 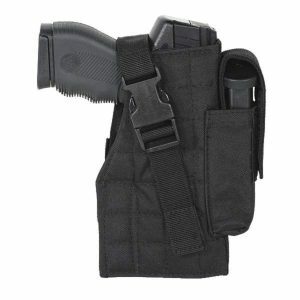 Generally the overall fit of the holster, as well as the placement and effectiveness of retention equipment. A common error with Leather holsters is that, while brand new ones are stiff and often need to be broken in, worn in ones can fold. Be careful if buying used, because the ability of the material to fold in can be a cause for negligent discharge. If it folds or bends and gets caught in the trigger guard, you’re in for a world of hurt. Some other things to look for would be missing stitches, a flat holster, or misshaped form. The retention flap or or strap is another issue to watch, as it can fall into the trigger guard. Holster recalls due to manufacturing error are a huge red flag. These can be very serious problems, as issues involved can cause you a discharge whether your weapon is holstered or being drawn. Always do your research before buying a holster. It’s not too hard to find recalls, whether you look it up online on manufacturing sites or check forums. It is better to prevent a problem now rather than after-the-fact. Probably the number one issue that causes negligent discharge is due to something getting stuck in the trigger guard. I mentioned leather holsters folding and the strap getting caught in the guard, but there are other factors to consider as well. Wearing your holster between a tucked-in undershirt and another garment can cause an issue if you are not careful. The materials can fold and bunch, thus getting caught in the trigger guard. Another cause could be a drawstring from a hoodie or sweatshirt. Regardless of how obscure that may seem, it is possible and that is why it is important to be aware of what is near your holster. While you have read a few ways of preventing the issue of negligent discharge in this article already, there is one other very important step to take in preventing the occurrence of something like this. That is frequent inspection of your holster and firearm. Negligent discharge happens in many ways aside from holster issues, but the holster itself cannot be ignored. That’s why it is important to check the retention mechanisms, materials, stitching, and overall structural integrity of the holster on frequent occasion. Along with that, never procrastinate inspecting your gun as well. Of course, holsters aren’t the only cause for negligent discharge, as there are many ways mistakes are made. The important thing to do is know the rules of firearm safety, research your holster and firearm, and put to practice what you learn. Molle Holsters are a good combination of retention, flexibility, and protection. These things will help to protect you from negligent discharge, losing your firearm, and overall keep you comfortable. Let’s take a look at the top picks. This holster has a BA allure to it, but it’s much more than looks. With adjustable sizing, reliable retention, and quality material, you’ll feel like you’re walking away without spending much at all for something that will last a long time. For a simple and reliable design, this inexpensive holster is a good holster for those looking for a lightweight option. 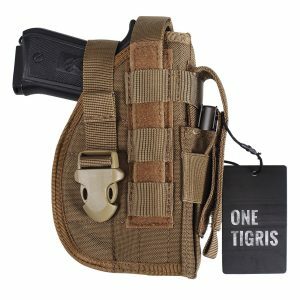 Whether you’re using the holster as a member of law enforcement, for open carry, or for sport (heck, even airsoft or paintball players like this holster) the OneTigris is a good option. It has good retention and is made to be dependable. This is another Condor holster, which is one of the most reliable Molle holster manufacturers. If you are after something flexible, this Coyote is a good choice for you. 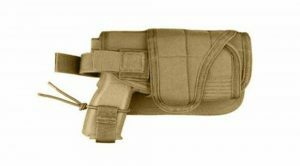 Now that you’ve had a chance to look at the top what choices, let’s look at our number one Molle holster pick. As said before, the CONDOR MA69: VT HOLSTER is our favorite. Condor is a reliable Molle brand, and this seems to be the top one they make. It’s very versatile, has fantastic retention, and if you’re okay with a little bit of a slower draw it will stay put at your side for as long as you need it. Of course, no holster is without flaw. Regardless of the bulkiness of its size or the fact that it is not the quickest draw, it is still a fantastic choice for anyone after that tactical appearance and reliability. Now that you’ve had a chance to look at some of our top holsters, perhaps you’ll want to go with our favorite. Or, maybe you prefer one of the other options or a different option entirely. Either way, we hope we’ve inspired you at least in the right direction in choosing your holster. Don’t forget to do your research on recalls, reliability, and construction in order to avoid negligent discharge or other serious mistakes. For a complete list of gun holster reviews, visit our holster resource page. Yes, it is nice. Where are other pictures of it? Where are the molle straps? I have a vest.